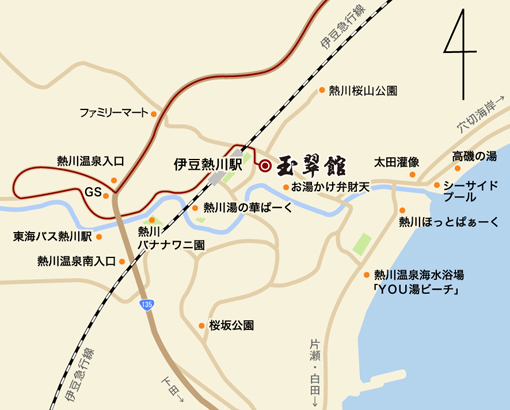 Atagawa Onsen Gyokusuikan is located just a 1-minute walk from Izu Atagawa Station. From Tokyo(Tomei Expressway) to Atsugi IC (Odawara-Atsugi Road)to Odawara(Toll Road)to Atami(National Route: R 135) to Izu-Atagawa. 2 hours and 15 min from Tokyo to Izu Atagawa by JR Limited Express Izukyu Odoriko: 2hours from Tokyo to Atami by Shinkansen Kodama/Hikari, and then to Izu-Atagawa.